gently fry the mushrooms in butter. in a large pan heat water and add two teaspoons of white wine vinegar. swirl the water around in the pan until it has a momentum of its own. carefully drop the egg yolk in the centre of the water and cook briefly until lightly poached. 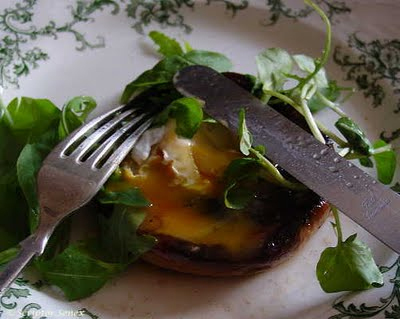 serve the mushroom cap-down with the egg yolk on top and then loosely drape the micro salad on top. i mentioned jello shots but when does one present jello shots at a dinner party. as the guests arrive? after dessert but before the cheeseboard? (tee hee!) 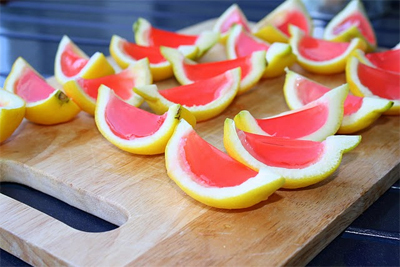 …and while i’m asking questions, do jello shots count as a drink? eh, who cares. even if it’s not a dinner party, i’m pretty sure i can come up with a great excuse to make these. my mouth is watering just thinking about them. 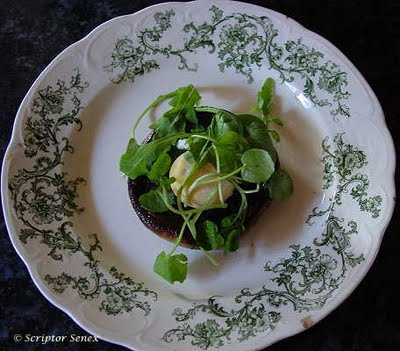 This entry was posted in dinner party, recipes and tagged egg, food, jello shots, mushroom, salad, starter. Bookmark the permalink. You have been quite prolific lately! it’s all part of my evil plan. Evil laugh coming along nicely.